The Organizing Committee of the Carrera Panamerican visited the Secretary of Tourism of the Government of Mexico. As part of the activities for the 32nd edition of La Carrera Panamericana, La Carrera de México visited Lic. Miguel Torruco Marqués, Secretary of Tourism of the Government of Mexico. On behalf of the Organizing Committee, Eduardo León, Honorary President discussed with the Secretary the plans for the 2019 edition route. 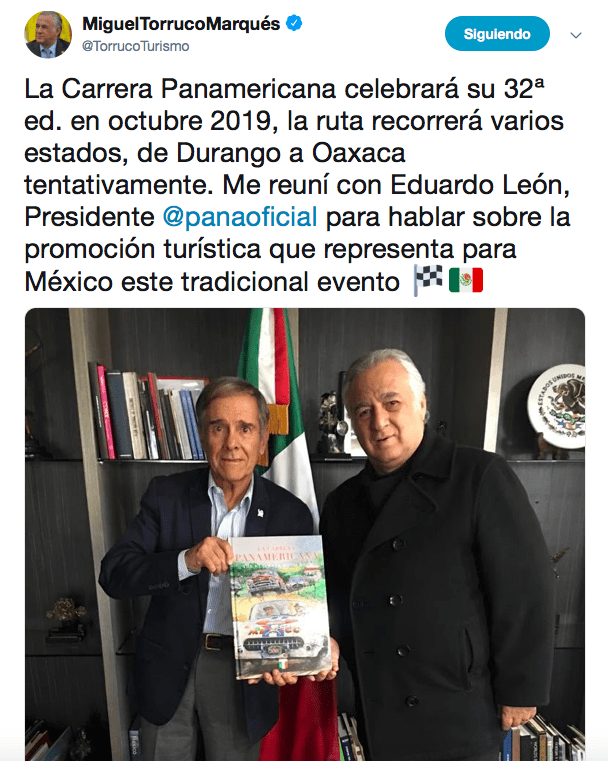 "For us it is a privilege to be one of the tourist promoters of our country, the Carrera Panamericana is a great banner of promotion of Mexico in the world, as confirmed by the hundreds of participants who come every year from all parts of Mexico and the world, the thousands and thousands of attendees to the goal arches and the great coverage in national and international media that is generated year after year. said Eduardo León.